Posted on February 2, 2016 . 26 Comments. With each year comes new opportunities and new plans. There is much we can accomplish within the length of one year. One of my students pressed the Beast after training for one year — and he started with 16kg. It’s an outstanding accomplishment, and I hope my article detailing his journey will help you to increase your strength and press the 48kg Beast. 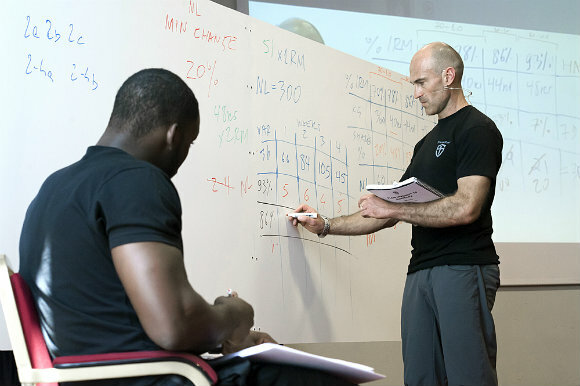 If you want to successfully complete a military press plan, the most important thing is to perform all presses with the best possible form. If you have the opportunity, get an SFG instructor to correct your technique. If you are an SFG instructor, then have another SFG instructor assist in your press plan, correct your faults, and give you advice. Although we follow the same program, my students need more time to complete their daily military press training than me. My students take about an hour, while I need only about twenty minutes to complete the same program. Building strength takes time, not just over the course of a year, but also within your sessions. You must feel you are ready to press all the repetitions of your next set. If you need more time, be patient. Don’t clean the bell, yet! I will mention a few different press plans below. Don’t try to rush through them all. If you have completed one plan successfully, give yourself time before starting the next one. My experience is if you don’t rest between two press plans for one to two weeks, then you will have serious shoulder pain. During this time, you can do easy presses. Try 5 sets of 5 at 60-67% of your 1RM along with heavy and slow get-ups. Before you choose your military press plan, you must press a perfect 1RM on both sides. You have to fulfill all SFG military press requirements! 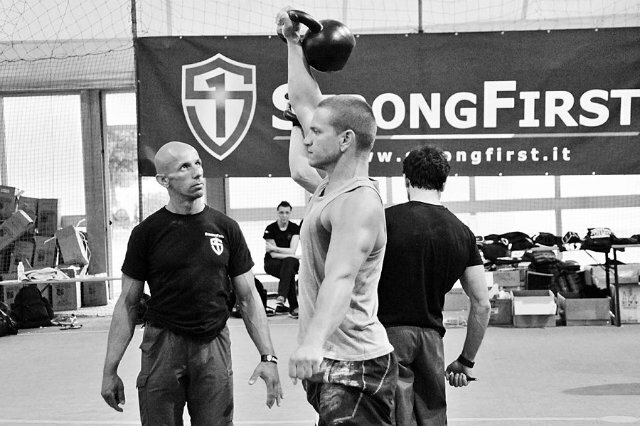 Grip: Before you clean the bell, make sure your hand is positioned correctly on the kettlebell handle. Arm Wrestling: If you have a straight wrist, the stronger one will win – either you or the bell. If you arm wrestle with the kettlebell, you will dominate and you will be the winner. Perfect Timing: When you start the press, clench your free palm. This will activate the antagonist muscles in the pressing arm. Precision: During the press, follow the bell with your eyes – but not with your head! 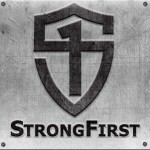 There are a number of proven StrongFirst military press plans in existence to take you from wherever you are to whatever your goal is. The best way to learn about these plans is through the Plan Strong Course. Below I will mention a few of them and who they are most appropriate for, as well as outline a couple that I have used in more detail. Pavel teaching at Plan Strong. This plan is for you if you have acceptable press technique and a training 1RM of 24kg. A training max is the maximal weight you can lift at any time with perfect technique and no psyching up. You should be able to do a series of singles with this weight. 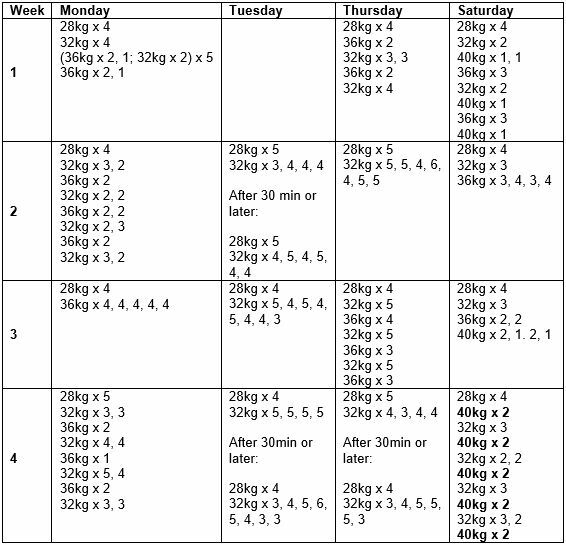 This plan is at a higher volume and using 80-85% of your 1RM. At this point you should be able to comfortably press your former training max five or six times. Note: On days when the volume is 40 reps or higher, divide the work into two series with 15 minutes of non-related and non-conflicting exercises in between. 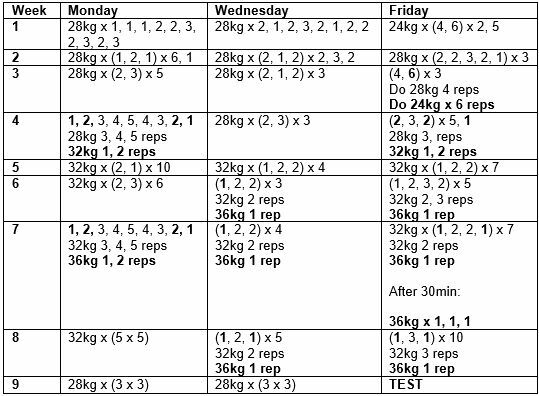 This is a hypertrophy- and strength-maintenance plan for a girevik with a 40kg military press 1RM. The 501G plan is recommended right after this one. This plan is for a girevik with a 40kg military press 1RM. For the girevik with a 44kg military press 1RM who has successfully completed the 501G plan – and thrives on very high volume and intensity. There are two versions of this plan, A and B. Below is the version B plan that I myself followed. Zsolt graduated from Sport Secondary Grammar School (Dunajská Strada, Slovakia) in 2013. That same year, he successfully completed the StrongFirst SFG Level I Certification in Hungary, at the young age of nineteen. He earned his SFL the following year, and he became an SFG II in 2015. Daniel, because this blog article is from a couple of years ago, it would be best to continue the discussion of it on our forum at https://StrongFirst.com/community. Please start a new thread there. 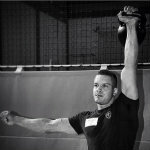 will the 32kg to 40kg: Zsolt Derzsi Plan also work for the double bell press? Is there a way that we may get access to the 501G and 499 plans? At least have a look? I would love to start working on the 501G. Hope to hear from you soon! Is it for double or single presses? Should I reclean before every rep? 1. what shoud I do before/after ‘press session’? 2. Should I trennig only at ‘press day’? 3. Shoud I do military press or clean&press? Well thought out road to The Beast. On the off days could I barbell squat or deadlift without impacting my pressing to much. I love to squat and I would not want to waste all that hard work. Text says 60 to 67% for maintenance. I assume this should be 60 to 70%? Very well thought out. A little confused on reps/ sets though. 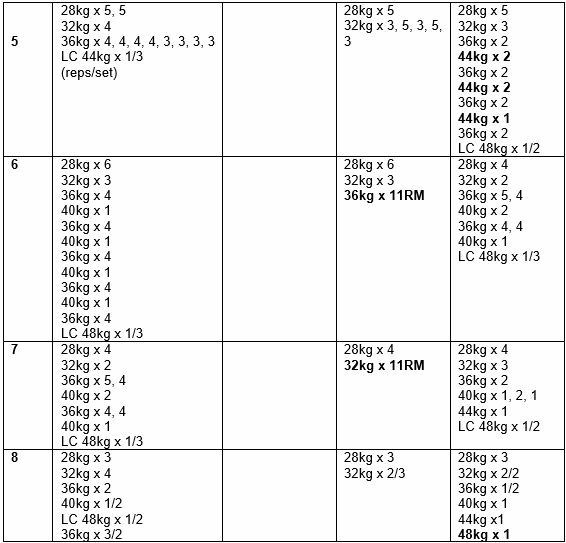 For example 24kg x (4,6) x2,5. I assume 24kg x 4 reps x2 sets and then and 6 reps for two sets. Is the 5 for the next number of sets? How long do you rest between the sets? Why is the first weight missing on almost half of the days in “From 32kg to 40kg: Zsolt Derzsi Plan”? Thanks for your explanation and for this article. It’s very helpful. It is clear now. Thank you! I was just wondering what the entrance point for this program was e.g. 1RM, 3RM, or 5RM etc.? Thanks. What is meant by “arm wrestling” with the bell? There aren’t many plan strong seminars on the calendar. Are there any plans to do many more, or possibly release it on DVD? Very succinct and informative article. I’m curious about the first two plans (410A/B): how do we go about obtaining these? Many plans that were meant for Plan Strong students only. Strong and solid work, Zsolt. Three times: your achievements, press and this article. Very helpful cues, informations and plans. Harald, thank you very much for your kind words!